eat, drink & be vegan: Spencer's winner... + VHK giveaway! Spencer's winner... + VHK giveaway! Spencer's Market has chosen a winner, and it is Jeff Loughridge! Congratulations Jeff, enjoy your vegan gift basket. Now, how about kicking off December with something special? 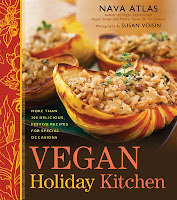 Nava's publisher has offered a copy of Vegan Holiday Kitchen to one of my readers. Comment on this post to enter, one comment per person eligible. Contest is open to residents of Canada and the US. Reminder: Please subscribe to my posts. I don't like asking for your e-mail address in the comments, so I will be posting the winner in a few days. If you don't get the notification, you might miss claiming the prize. Thanks. And, if you already have a copy of VHK, just think... now you can have that second copy for your coffee table! I'd *love* a copy! I'll be cooking christmassy meals for my immediate family, so it'd be a big help. I'd love to win this book. I'm cooking a vegan Christmas Eve feast for my family. Like you hinted in an earlier post, the cover alone is enough to make you turn Vegan. This book looks good enough to eat!! Oh, I would love to have a copy of Vegan Holiday Kitchen! Many thanks for offering us a chance at winning one! pick me pick me -look forward to sneaking vegan fare in where I can @ our open house. At the race I organize we have vegan chili & truffles - super yum! I'd love to win! Thank you for the giveaway! I would LOVE to win a copy of that book! I always have a hard time deciding what to take to family holiday gatherings since I'm the only vegetarian. I think this book will have some inspiring offerings that even the meat eaters will love. Hosting a holiday party soon, and would love to have this book for some delicious ideas!! lots of non-vegans to impress!!! I love holiday cooking, especially for my family! This book looks wonderful. Ooh I would love to win this book, it looks really good. Thanks for offering the giveaway Dreena! I would love to try out that cookbook! May I take this opportunity to wish you a very merry Christmas and a wonderful new year. this one is one my xmas list... if i don't win it first, lol. This book looks amazing! I would be thrilled to win a copy! Ooh! What a wonderful book to be giving away right before Christmas! I would love to win. I keep seeing this book around, it looks awesome! I loves me a book with nice photos. I would love to win! Thanks for the opportunity. Nava is a genius and her new book looks amazing! I can't wait to try some of the recipes! I have been eyeing that book in my local bookstore! I would love to have a copy of my own! looks like a beautiful book! I would LOVE this! I will be cooking a vegan Christmas dinner for my non-vegan inlaws this year and I am always looking for new ideas! I've been seeing great reviews of Vegan Holiday Kitchen, and would love to win a copy! There's something magical about thumbing through a beautiful vegan cookbook! I'd love to get a hold of that one! The book looks great! I requested that my library buy it, but I'd love to have my own copy. I'd love a copy. I love her soup cookbook! I have heard so much hype about this book--it looks amazing! I am drooling over this book! This is on my Christmas list. Won't you be my Santa? I'd love to win a copy for the holidays! This book sounds beautiful. I would love to win a copy! My husband and I eat mostly vegan and this Christmas we have decided to have a vegan Christmas for our carnivorous families. Whenever we cook for them the comment is always how good the food is and how flavorful the meal is. We have already purchased a copy for ourselves but would love to have a coy for our families! I would love a copy of this book! I'm just starting on my journey to becoming vegan and am always looking for great cookbooks to get me through. I would love a copy of this book! Especially for the Jewish holidays. ooooh I especially want to try the recipe from the cover! what a fabulous christmas gift to give myself! thanks for the chance, dreena! thanks for the opportunity, Dreena! omg! both you and bianca from vegan crunk have been posting a lot about this cookbook and it just sounds soooooo yummy! :) crossing my fingers! I would love this book - thanks for all the giveaways!! Still never won a giveaway, maybe this will be my lucky day? This book has been on my wish list since it came out! I'd love to get a copy of this. All the reviews online look great! There is always (surprisingly) room on my shelves for another vegan cookbook! Greetings and thanks so much for the excellent give-away...looks like a fab. book to add to my VEGAN collection....so many delicious recipes to try! Sincerely, Valerie. Thank you for the giveaway - I'd love a chance to win a copy. I would love a copy, I love wow-ing my family with delicious vegan food and Christmas is a big opportunity to show that a plant-based diet doesn't mean giving up flavour! I'd be so thrilled to win this book, it looks awesome! Thank you for the opportunity to win this beautiful book! I would love a copy--just in time for Christmas. Thanks. I'm a new vegan and would really love to win! I would love a copy of this book!! This cookbook looks awesome! Would love to win one! would be brilliant to win! Your cookbook looks amazing and I would love to add it to my collection. I absolutely love cooking! I would love to win a copy! I just hosted my first vegan Thanksgiving and will be repeating the performance at Christmas! :) This would certainly help out! This cookbook is on my wish list! I've already made one recipe that was kindly posted by another blogger and it was very yummy indeed. Mmmm...holiday food! I'd love to have a copy of the cookbook. What an awesome gift to me it would be! Oh, I would love this! This book looks amazing. Even if I don't win, I'll end up getting a copy somehow (hope Santa's reading this!). I would love a copy of this book. Just beginning the journey of eating a vegan diet. Thank you for the giveaway. This looks like a great book! I would love to try to recipes from this book! Vegan Thanksgiving was a hit with my carnivore family, I'd love recipes to use for Christmas! I hope I luck out and win! This book is gorgeous! I was distracted from work yesterday for an hour reading your book review and then browsing Susan Voisin's blog, to which you linked, and to which I am now also subscribed! Thanks, Dreena! I would love to own this beautiful book! I'd love a copy. I would like to win over the dreaded meat eaters...lol...all the way. I've heard so many good things - hope I win! I've been eyeing this forever now! Fingers crossed :) Thanks for the giveaway! I would love to win this book - looks absolutely amazing! what a beautiful book! Judging by the cover, it is overflowing with deliciousness. Looks like a great book to add to my collection! I saw the recipe for VHK's Seven-Vegetable Couscous in the NY Times and bookmarked it, but that chocolate cake with orange slices in your review needs to be made (and eaten!) ASAP! Thanks for the giveaway! This cookbook looks amazing! I love the recipes in your other books and can't wait to try some of these. My husband & I became vegan for health reasons 4 years ago and don't want to ever go back to eating the way we did before. We're the only vegans in our immediate or extended family, so I'm always looking for new recipes that will help family members realize vegan food can be delicious with the right recipe. I was going to ask for this for Christmas, but it would be great to have it earlier since my husband and I are hosting the family! Thanks for the the giveaway! I would love to win this cookbook! i'd love to win this! I've been a Nava Atlas fan for years! I really, really want this cookbook! thanks for hosting your giveaways. I would love to have this book so I can make vegan-friendly items for my myriad vegan/vegetarian friendlies.